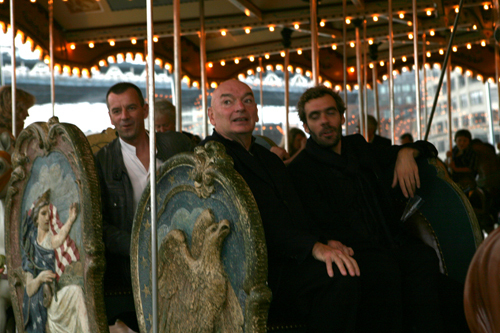 The man in black designing a Merry-Go-Round seems a jarring fit. But out on the Brooklyn waterfront buffeted by winds on a raw point between the muscular grandeur of the Brooklyn and Manhattan bridges, Nouvel seems just the right man to insinuate something as delicate as a life-size interactive music box into a setting as tough as the Brooklyn waterfront. 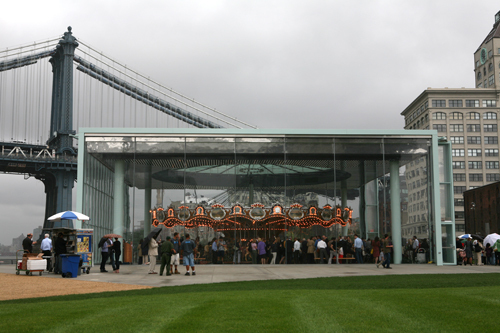 The contrasts were not lost on the architect who said shortly before the ribbon-cutting today that he wanted to make a shelter for the 1922 carousel that was “a little tender but not too cute and with a feeling for the poetry of the situation.” His original dream was to encase it all in glass but getting down to a more realistic budget, acrylic glass turned out to offer something even more interesting and close to the architect’s temperament: distortions. He dismissed concerns—shared by the client it turns out—that the acrylic would scratch and yellow: “That’s the old acrylic,” he said. Fully aglitter in the oncoming rain with light bulb coronas trimming painted bucolic scenes and the rearing stallions doing their thing to the tinny music, there were also familiar Nouvel moves as in the voyeurism of the rubber black and mirror-striped ceiling and the precision joints of the acrylic itself. Apartment dwellers in the neighborhood will get the added thrill of a nighttime show when shadowy projections of horses leap onto a ceiling scrim lit up til one a.m. like a magic lantern show.The project has been decades in the making and a labor of love for Jane Walentas of the Walentas Brooklyn developers; she scraped old paint off the horse figures herself to get the restoration going. Jane and David Walentas have known Jean Nouvel ever since they tried to get an ambitious hotel cantilevered over the river that he designed for a nearby site. The carousel proved far more popular with the public, and also more do-able. It is a gift from the couple to the city and Brooklyn Bridge Park.Regina Myer, president of Brooklyn Bridge Park, cut straight to the point, "It's not about the container. It's great because it makes the carousel look good."